– Hello Jack Wylson, thank you for agreeing to be interviewed on documenterre.com. You are one of the directors & editors of: « Mahout The great elephant Walk ». Your documentary tells the story of Tim Edwards, who wants to relocate four elephants between two national parks in southern Nepal, one of the most densely populated regions in the world. During your journey, can you give an idea of the difficulties of the workers named «the Mahouts», but also the relationship between these men and their animals. The mahouts are incredible people. Their entire lives are dedicated to their elephants, so the bond they share is very strong. On the journey they had so many difficulties, with traffic, crowds of people, the monsoon rains… but they always remained calm and the elephants certainly responded to that. – A « mahout » is a person that takes care of elephants, protects and raises them. Why did you choose this specific subject and follow one of them, between two national parks, Chitwan and Bardiya ? The story came to us (James Dartnall who I directed the film with, and myself) through Tim, who was an old university friend of ours. In fact the three of us all met in the Biology department at Bristol University, but we had no idea that we’d all be working together in future. – What kind of difficulties does a mahout have daily ? The mahouts start very early, they’d be up long before sunrise, getting the elephants ready for the days walk. We only walked until mid-morning, when the sun made things too hot for us & the elephants. So the walking all had to be done before about 10am. Then, we’d make camp and the mahouts would have to go off finding food for the elephants, take them to bathe in rivers, check their feet for and cuts, and so on. They were constantly on the go. – What is the relationship between people of Nepal and elephants ? Is it a sacred animal for them ? Hindus recognise elephants as incarnations of Ganesh, the elephant-headed Goddess of wisdom and prosperity. This was a big cause for concern for us because people wanted to touch the elephants. Sometimes we’d have hundreds of people all trying to touch them at once. These elephants came from the jungle, and weren’t used to crowds of people, so the mahouts would have to keep them away, or risk them being spooked and stampeding, which could have been deadly. 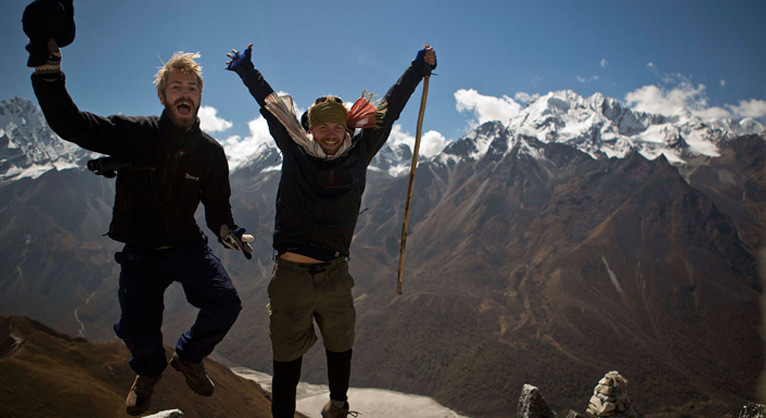 -You have filmed over five weeks in Nepal between September and October 2012. Did you meet any difficulties in filming and realising your documentary ? It was incredibility tough to film for a number of reasons. One of the hardest was not having any power. We had to charge all our equipment (cameras, laptops, hard drives) all off the Land Rover car battery! We also experienced the monsoon rains and the heat too, just like the mahouts and their elephants. We were with them they whole way. I remember one night in the tents when James & I were sleeping on our backs in two inches of water, holding our camera bags on our chests. It was the only dry place. – Are people of Nepal open minded in a front of a camera ? They were interested in the cameras, but they were more interested in seeing the elephants, so we managed to capture some quiet sincere moments. Filming on DSLRs, fortunately most people still think you are just taking pictures. The mahouts on the other hand, they were very camera shy. They got used to us filming them day in, day out, but when it came to interviews, they were so timid. It was very difficult to get them to talk openly. – How did you finance the production of the documentary and this 5 week expedition ? The film has been self-financed, so we never had any budget. Everyone has worked for free, and we’re extremely grateful to the people who have helped us along the way. We couldn’t have done it without them. -Where will we find the full movie? The full movie will be available via our website soon, and we’re being distributed by Off The Fence, so hopefully it will be on various TV channels. If you follow us on facebook or twitter, we’ll keep you posted!